A federation of ski clubs serving Western and Central Pennsylvania and Northeastern Ohio. If you would like to add any ski trips to this website, please email the details to webmaster@wpsc.net. Please include the PDF of the Trip Flyer and the text of the trip detail (for example: Meadville Ski Club’s Powder Mountain, UT – 2/25/17-3/3/17). This will help me get your information on the website sooner. Click here for the updated flyer. We are currently accepting applications for nominees to be inducted into the hall of fame for 2014. If any of you know somebody who has contributed greatly to the sport of skiing and the industry, please go to our website and click on the hall of fame link, and then scroll down to the form. Please review the form first before you nominate the individual. There are 2 versions, one is in PDF and the other is in word. Please submit your requests to Gary Johnson. The deadline to submit nomination forms is 1-15-14…. The Western PA Ski Council would like to recognize and thank the prize donors who generously supported the WPSC Hidden Valley Halloween Party. The 2013 WPSC Race Series has been posted. There will be a Slalom Race on Avalanche on Sunday, March 3rd. This is a make up race for the feb 17th race that was cancelled. Also, make sure to check http://www.wpsc.net/racing/ for results and updates. The Mon Valley Ski Swap will be on Sunday, November 18, 2012 at the Seven Springs Mountain Resort. This Ski Swap is open to the public and is one of the largest Ski Swaps in the region. Sell your old gear to people who will really use it! The event will be located in Festival Hall (the closest building to the tubing area that is attached to the main lodge). This location makes it easy for people to to unload & load their gear. Charity: This year MVSC and the 7springs Ski Patrol will have a donation booth set up for the Wounded Warrior Patrol, a 501(c)3 non-profit (yes, donations are tax deductible) that supports and teaches skiing to wounded military veterans and their families. The organization is in desperate need for all types and sizes of ski clothing, ski equipment and/or cash donations. If you have any questions about how you can help please email kyle@monvalleyskiclub.org. 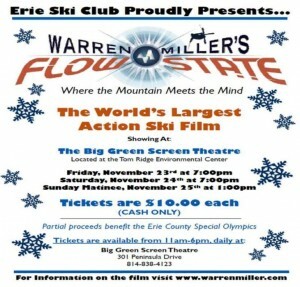 The Erie Ski Club proudly presents Warren Miller’s Flow State, Where the Mountain Meets the Mind. 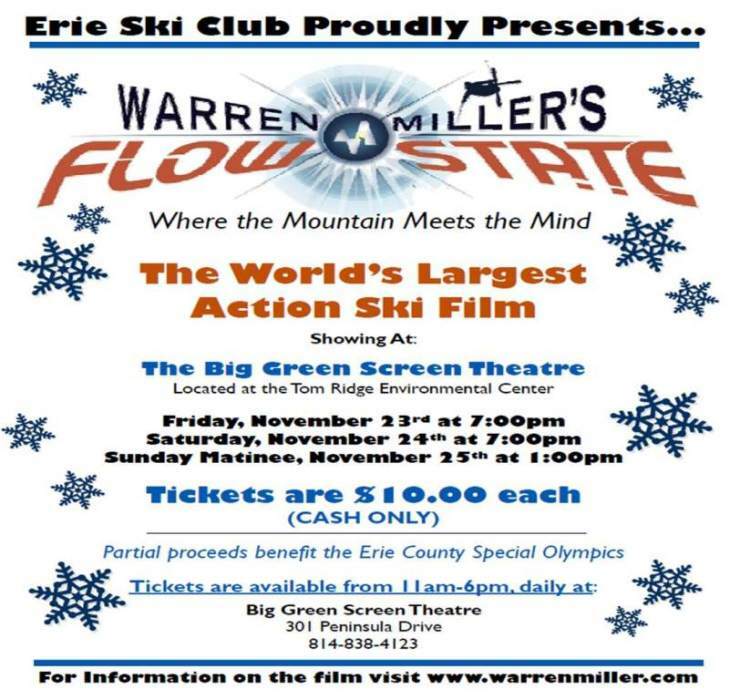 The world’s largest ski film will be showing at The Big Green Screen Theatre located at the Tom Ridge Environmental Center in Erie, PA.
Tickets are $10.00 each (cash only) and partial proceeds benefit the Erie County Special Olympics. Tickets are available from 11am-6pm daily at the Big Green Scrren Theatre.